Ten Of Pentacles. Tarot. Free Tarot. Free Tarot Reading. This scene depicts both plain and intricate structural designs. There are also shown three phases of humanity that stand for three states of consciousness. A man, woman and child are symbolic of the conscious mind, the subconscious mind, and super-subconscious mind. Off to the side is the Ancient, observing and knowing the future of those he sees through the arch. The two gray dogs denote the development of the animal kingdom. (Gray is the result of mixing black and white; this shows balance.) Notice the balance scales built solidly on the arch, above the Ancient's head. This implies that the balance is won, and the scales can no longer be tipped. 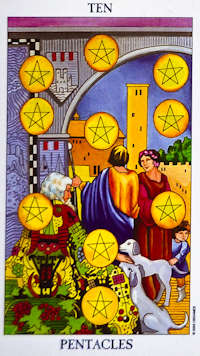 The pentacles are arranged in the pattern of the Tree-of-Life design, showing that the greatest attainment comes from achieving balance while on the earth plane. This is a picture of success and fulfillment in every way.